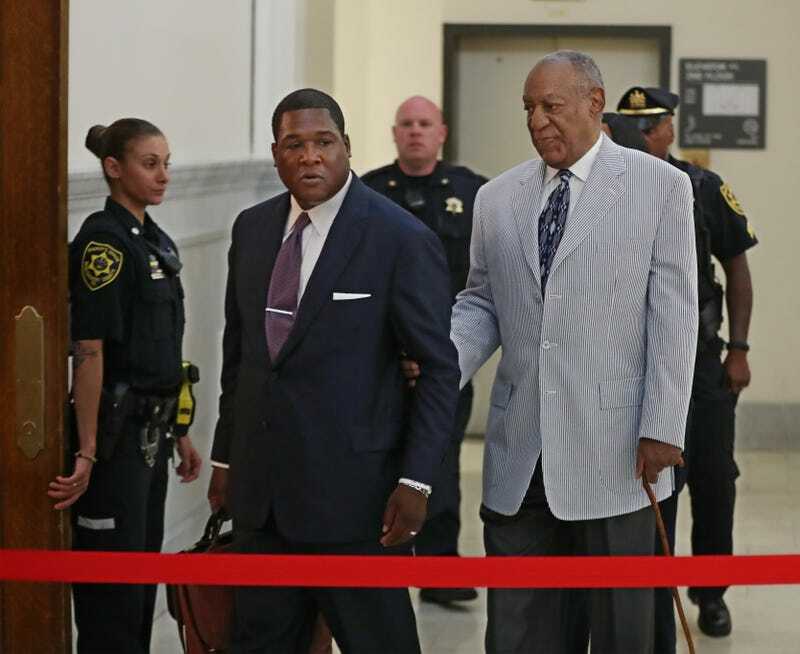 Bill Cosby (right) is led into the Montgomery County Courthouse by one of his aides Sept. 6, 2016, in Norristown, Pa.
Bill Cosby's trial will be scheduled for no later than June 5 of next year, presiding Judge Steven O'Neill ruled at a preliminary hearing Tuesday, CNN reports. According to Fox News, O'Neill noted that Cosby is blind and offered whatever special accommodations are needed to ensure that the process continues smoothly. Prosecutors said they want 13 other women who said they were intoxicated when they were assaulted by Cosby to testify. The defense, the network notes, is expected to oppose the testimonies. The criminal case against the now-infamous actor surrounds his 2004 encounter with former Temple University employee Andrea Constand at his home near Philadelphia. According to Fox, prosecutors may be permitted to introduce evidence of other alleged acts, even though charges were not brought in those cases, in order to demonstrate a pattern of behavior. Constand accused Cosby of drugging and assaulting her. At Tuesday's hearing, the court heard a telephone conversation, recorded by Constand's mother, during which Cosby described the act as "digital penetration" while refusing to tell Gianna Constand what pills he had given Andrea Constand. Cosby's lawyers have asked that the prosecution not be allowed to use the recorded conversation at trial, arguing that Cosby did not know he was being recorded and, thus, the tape should not be allowed under Pennsylvania's two-party wiretap law. Defense lawyers are also hoping to have the case moved out of Montgomery County, Pa., where it was a key part of District Attorney Kevin Steele's campaign for office against the prosecutor who decided not to charge Cosby in 2005, according to Fox. Cosby and his team have been battling to have the charges thrown out ever since he was arrested last December, even countersuing some of Cosby's accusers.